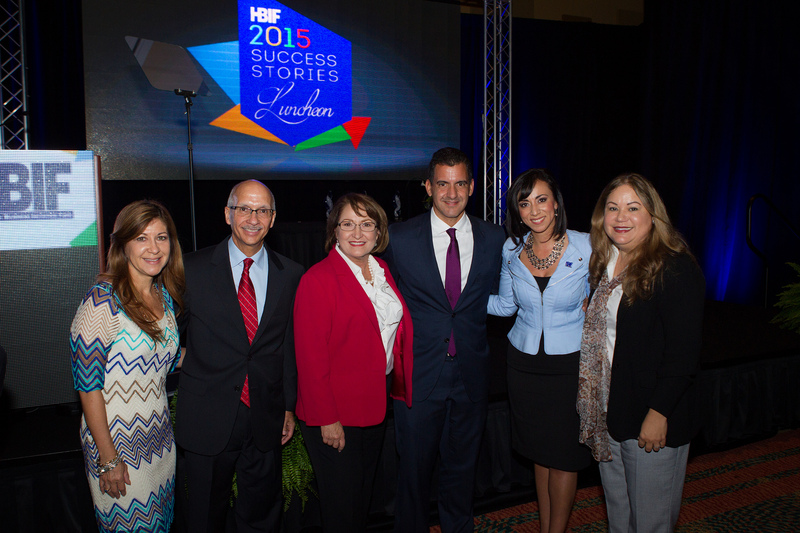 Orange County Mayor Teresa Jacobs recently joined community leaders at the Hispanic Business Initiative Fund’s (HBIF) 11th Annual Success Stories Luncheon in support of Hispanic entrepreneurs throughout Central Florida. Held at the Rosen Centre on International Drive, the event was attended by more than 500 community leaders. The event honors and recognizes Hispanic entrepreneurs who have started or expanded a business with assistance from the HBIF, Florida’s leading Hispanic economic development organization. HBIF’s 2015 honorees were selected based upon their outstanding business achievements. Those recognized included Joneyra and Johnny Laya of 4Pets Mobile, Edson Brito III of Construemax and Ricardo and Rick Ballester of ECX Electronics Corp.
HBIF is a nonprofit economic development organization that serves Orange County’s Hispanic business owners by providing quality bilingual business development and training services to help strengthen their business and Florida’s economy. This organization has assisted thousands of Hispanic entrepreneurs since its inception 24 years ago. As of 2011, one out of five businesses in the Orlando area is Hispanic-owned and 29 percent of Orange County’s population is of Hispanic heritage. In recognition of this economic impact, the Board of County Commissioners allocated $125,941 to the Hispanic Business Initiative Fund (HBIF) in FY 2014-15 and $128,460 in FY 2015-16. From extraordinary culture, arts, academic achievement and leadership, our Hispanic citizens and businesses have had an incredibly positive impact in Orange County. On Sept. 10, the region celebrated with the Hispanic Heritage Committee of Greater Orange County (HHCGOC) at a festive kick-off reception at the Orange County Regional History Center. The event featured musical performances, delicious food from Sedano’s Supermarkets and an exhibition highlighting the works of talented local Hispanic artists. The HHCGOC is a volunteer-based organization founded in 1999 with the purpose of providing opportunities that promote and highlight the contributions made by individuals of Hispanic descent in the community. Orange County will hold its next Hispanic Heritage Month celebration, the festive annual Orange Fiesta in the Park on Oct. 10 at Blanchard Park, 2451 N. Dean Rd., from 11 a.m. to 3 p.m. This event will feature several food trucks, musical performances, children’s activities and diverse exhibitors for all to enjoy. Photos from the HBIF luncheon may be found on Flickr for use by the media.